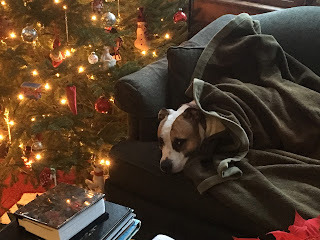 Tallulah rested on the couch after a quick foray out to our frigid yard. She was a good dog and peed and pooped in the pachysandra, then raced one quick, wild tear down to the woods and over to the naked magnolia. Ears blown back, grin wide, her flank almost touched ground as her whippet and Jack Russell genes kicked into gear. She practically skidded to a stop at the back door and could not be coaxed into another run around. Her footpads are pale pink and her fur, short and sleek: minimal protection in this week’s Arctic temperatures. Forty years ago, most mutts seemed to be a mix of beagle, some shepherd, and maybe a little collie. Now, it’s rare that they don’t have some pit bull. 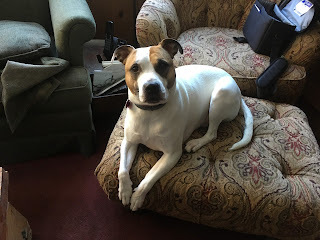 Tallulah is a generous mix of breeds, pit among them, but she looks more like a delicate boxer, the whippet input having slimmed her muzzle and streamlined her body. 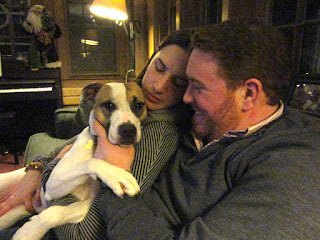 This was our first sleepover with our grand-dog. Her parents, Casey and PJ, courageous souls, had headed into the city for a New Year’s Eve Phish concert. We all wondered how this over-night initiation for grandparents and dog would go. While Tallulah and I watched from the window as her car pulled away - without her! - she danced anxiously, her tail wagging in jerky, hopeful movements. PJ and Casey always provide Tallulah’s part in any dialogue in a breathy little kid’s voice, and I find myself doing it too. With her ears perked, head cocked, and eyes round with concern, her thoughts were apparent. “Sure. Sure. That’d be good…” I supplied her answer and the banana, then she trotted back to the den and climbed onto the couch to keep watch at the window. Just as our malamute, Teyo, was our first child, so it is with Casey and PJ and Tallulah. 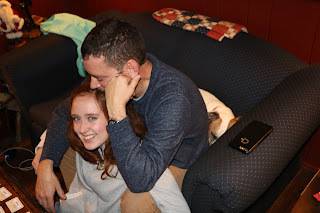 And I am grateful she found her way to our kids. They love, cuddle, and spoil her, and she should have all that. If she had the words to tell her story, it would be a tale with too much heartache. 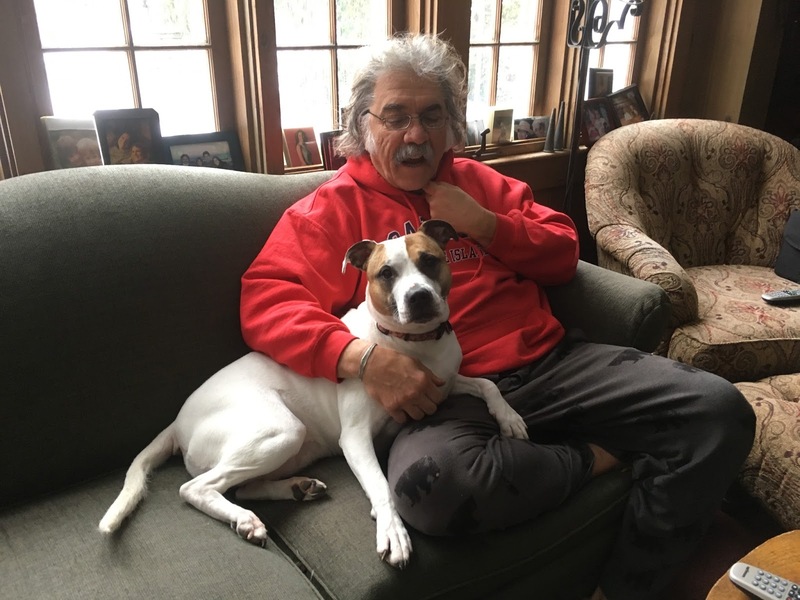 Within her first year, four other families “gave her a try,” but she was too active, or their other dog couldn’t get along with her, or they had to move to an apartment that didn’t allow dogs, or the added expenses were too much. Tallulah is active, but she is a dear girl, and I don’t like thinking about her feelings during those repeated abandonments. One might say I’m personifying too much, but I don’t think so. Human denial of animal emotions is a convenience that has enabled the meat industry, animal experimentation, and puppy mills: a multitude of betrayals. Still, I know dog-ownership’s not easy. About 25 years ago, I burst into tears in the grocery store when an acquaintance said hello and asked how I was doing. After years of ease with an aging dog, we’d recently gotten a new puppy, Kodiak. I’d forgotten what that was like: the chewing, the stains on the rug, the need for training. I had a full schedule of volunteer work while the kids were at school; what had we been thinking to get a puppy? It was more about what we were feeling, I guess. We missed Teyo’s comforting bulk, loyalty, love, and calm presence. And of course Kodiak became the beautiful, dear friend we were looking for. 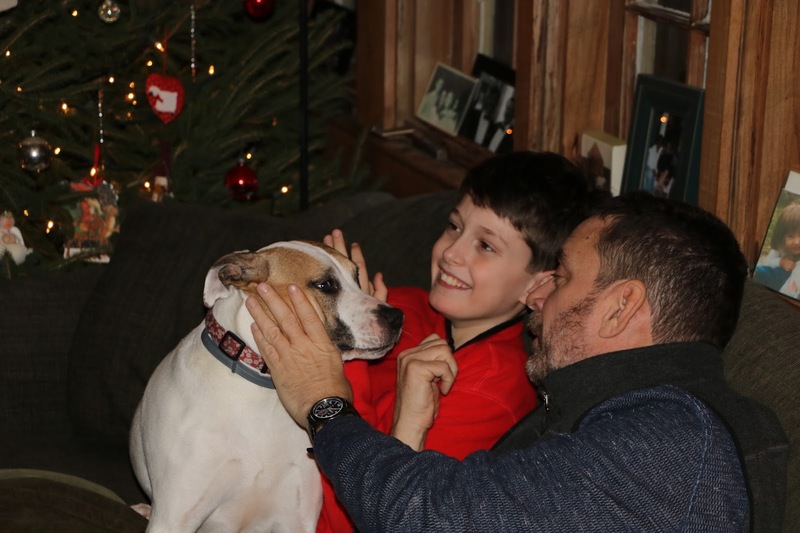 Early in the adoption adjustment phase, Tallulah was a challenge; she has all that whippet and Jack Russell dancing within… and often, spilling out. It didn’t go well when she chewed through the couch upholstery in the first month. But she is expressive and endearing, and PJ and Casey are crazy in love with their girl. She has not learned… Dave has. We don’t give animals enough credit for intuition, and Tallulah knew Dave was the one she’d have to win over. And she did. Last night, the Tone family joined us for dinner and a game of Code Names to usher in the New Year. Knowing Tallulah can get agitated and jumpy when guests arrive, we conducted a few “welcome drills.” Repeatedly, I dashed to the window and said, “Is that the Tones’ car? Are Maggie, PJ, Cathleen, and Don here?” Tallulah would scamper beside me, rise up on her hind legs, place front paws on the windowsill, and scan the road. When their car pulled up, she was ready: familiar with their names and happy to greet them. Yes, she jumped on them, but just a little. While the kids and Cathleen were delighted with her, she sensed she’d need to make more effort to win over Don. He got all kinds of kisses and attention… not his first choice perhaps? Tallulah was persistent, and I think she got to him. And she was his cozy, if not so participatory, teammate for Code Names. 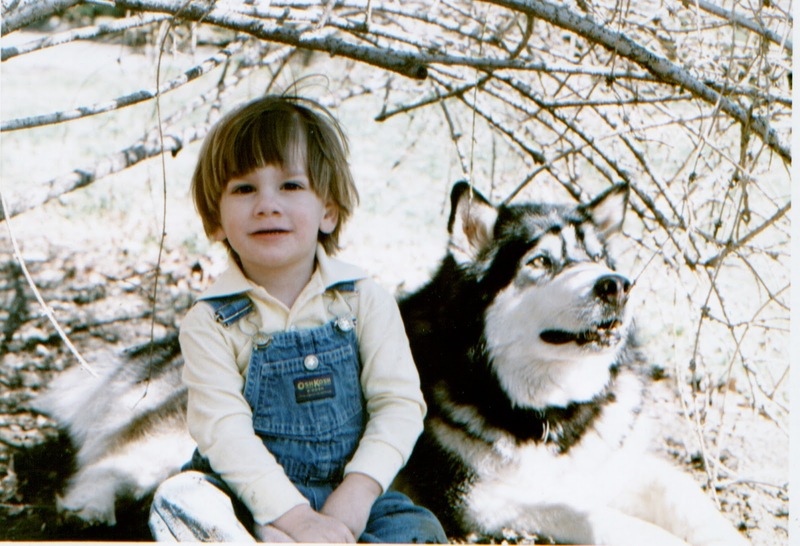 I always loved your dogs. Such magnificent beasts! Tallulah is lucky to have connected with Casey and PJ. She is adorable! Lexi became our first dog with full access to her own chair...not the leather love seat, but an oversized chair that is perfect for her. I'm not quite sure why it happened with her and not our others, maybe I've just relaxed enough, or gotten old enough to realize what is and isn't important in life. She's comfy in her chair and I am happy to have her there. It was so good for me to read this right now since Sean and I are in there process of dealing with a puppy after living for 17 years with Buddy, the perfect pooch. Barnaby is a challenge but becoming less so every day, as puppies are likely to do. I know in my heart of hearts that in a blink of an eye, Barnaby will soon enough be his own kind of perfect pooch. Thanks for reminding me of that.